It’s been several months since I last updated you on our progress toward testing an antisense oligonucleotide (ASO) gene therapy in a child with A-T. In this update, I thought I’d go a little deeper on a couple aspects of our development efforts, including some challenges we’ve recently overcome and some opportunities that have emerged to improve our chances of success. One of the challenges we’ve recently tackled was finalizing a manufacturer to produce quantities of both research-grade and clinical-grade ASO compounds that could work within our budget and our timeline (the two types require different manufacturing conditions). We’ve now selected a Massachusetts company that can manufacture both types of compounds for us in about four weeks. Importantly, unlike the other companies we first spoke with, this company has the capacity to make the compound for us the moment we’re ready. Meanwhile, Dr. Timothy Yu’s lab at Boston Children’s Hospital and Harvard has identified not one but two different candidate ASO compounds that effectively suppress the specific A-T gene’s mutation in cultured cells from the little girl we’ll be dosing. Because these two compounds are equally promising, we’ve elected to split our toxicology studies into two phases, testing both compounds in an initial phase before selecting our final candidate for the second, extended phase of safety studies. 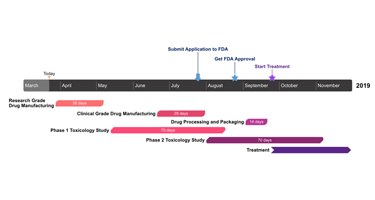 Although this two-phase approach has added time to our plan, by being more thorough, it increases our chances that at least one of the compounds will pass safety evaluation (as well as the likelihood that it will pass FDA muster). I’m also pleased to report that we’ve started working with a toxicology partner who can perform the testing for us quickly and cost-effectively. The chart below depicts our revised timeline. Apart from some minor delays that may occur, we’re still expecting to treat this little girl by September. As this historic milestone approaches, we can’t help but feel a renewed sense of urgency to reach our goal. And, we never forget for even a moment that this project would not be happening without the wonderful support we’ve received from you.